At my cottage you’ll experience your treatment either lying on my comfy therapy couch or sitting in a chair with soft music, incense and candles to relax you even further! A full Reiki treatment lasts for approximately 45 minutes to 1 hour including your initial consultation chat. As a practitioner one knows instinctively when the treatment is completed for that session and as such cannot time it, this is a rough guide as to how long it can take. If you fall asleep (yes, you can be that relaxed and it happens quite often!!) I will wait for you to wake up on your own. Wherever you are comfortable and undisturbed. Reiki can be sent across distance and time, as geography and the passage of time are no barriers to healing. Reiki is a pure energy form and can travel to wherever it is sent – even to the past or a specific situation. Distant treatments are sent at a pre arranged time and can be just as powerful as the one to one treatments here. We arrange a mutually convenient time, and then you sit or lie in a quiet room, you can light candles or incense and play some soft music, or not, peace and quiet is fine and I send the healing Reiki energy to you. Many people ask me to send while they are sleeping at night, this way we can guarantee you won’t be disturbed and will wake refreshed! 1. Click on the Book Now button below and select the Reiki Treatment option you prefer from the list. You will be directed to my online calendar to book your appointment which is also confirmed by email. If booking a block, please contact me to arrange the rest of your appointments. 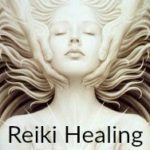 Reiki will automatically go to wherever it is needed, on every level – however if there is a specific issue, problem or ailment you wish me to focus on I can do so, just advise me via E-mail here. I treat all information in the strictest confidence. 1. Click on the Book Now button below and select your Distant Reiki Treatment option from the list. You will be directed to my online calendar to book your appointment which is also confirmed by email. Appointment times shown are London UK time. If booking a block, please contact me to arrange the rest of your appointments. 3. If you require a treatment while sleeping just select any appointment time and email me to advise what time you go to bed. Please note, payment is required before I can accept or confirm any booking. The system will automatically cancel any appointment received without accompanying payment.